Background: Pseudostellaria heterophylla is an important tonic traditional Chinese medicine. However, the molecular changes in the herb from geo-authentic habitat and cultivated bases remain to be explored. Objective: The purpose of this research was to study differences in P. heterophylla from geo-authentic habitat and cultivated bases. Methods: High-throughput technologies of transcriptomic and proteomic were used to identify proteins. Isobaric Tags for Relative and Absolute Quantification (iTRAQ) MS/MS has been utilized to evaluate changes in P. heterophylla from geo-authentic habitat and cultivated bases. 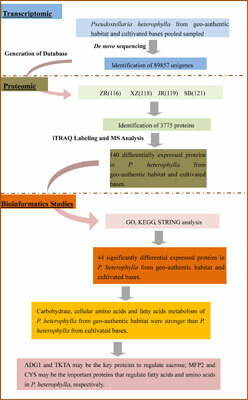 Results: In this study, a total of 3775 proteins were detected, and 140 differentially expressed proteins were found in P. heterophylla from geo-authentic habitat and cultivated bases. 44 significantly differential expressed proteins were identified based on functional analysis classified into nine categories. Five differentially expressed proteins were confirmed at the gene expression level by Quantitative realtime PCR. Catabolic metabolism, carbohydrate metabolism, and response to stress of oxidoreductases and transferases in P. heterophylla from geo-authentic habitat were stronger than in those from cultivated bases, but protein folding and response to stress of heat shock proteins, isomerases, rubisco large subunit-binding proteins, chaperone proteins, and luminal-binding proteins in herbs from cultivated bases were more active. ADG1 and TKTA could be the critical proteins to regulate sucrose; MFP2 and CYS may be the crucial proteins that control the metabolism of fatty acids and amino acids. Conclusion: These results will provide the basic information for exploring the differences in secondary metabolites in P. heterophylla from geo-authentic habitat and cultivated bases and the protein mechanism of its quality formation. Pseudostellaria heterophylla, geo-authentic habitat, cultivated bases, proteomics, transcriptomics, iTRAQ.